1 Rinse the chicken breasts, pat dry and cut along the side, so that they unfold and can lay flat. Top with one slice of ham and one slice of mozzarella. Season with salt and pepper, and sprinkle with some sage leaves. Roll up and secure with toothpicks. 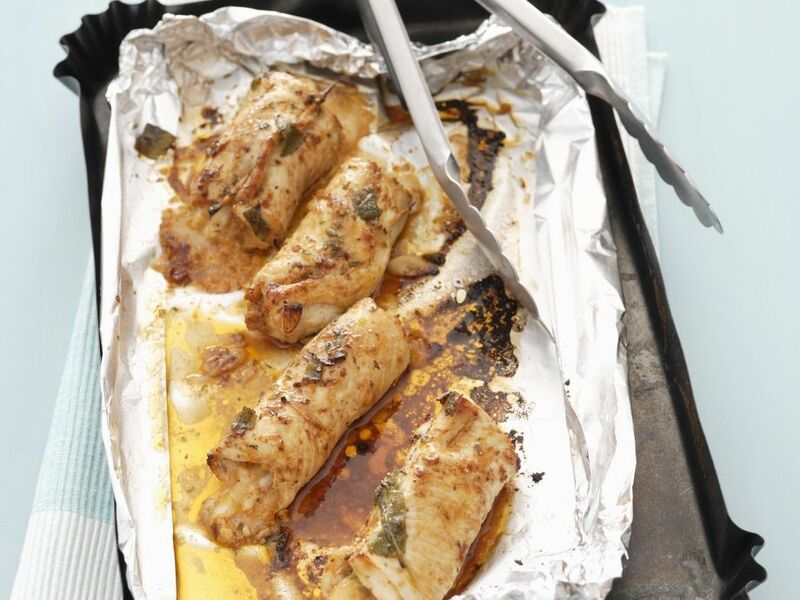 2 Line a baking sheet with aluminum foil and brush with 1 tablespoon oil. Transfer the chicken roulades to the baking pan. Sprinkle with salt, pepper, and coarsely chopped sage leaves. Drizzle with olive oil and bake in preheated oven at 180°C (approximately 350°F) for about 20 to 25 minutes or until golden brown. Remove from oven, remove toothpicks and serve.